'Tis the season for horror flicks, and in honor of the tradition I thought I'd share some remixed "horror" film trailers. One of the design highlights of my Vegas getaway (aside from my dear friend's wedding of course!) was my first look at the Wynn hotel and casino. Now, the structures are gorgeous as they are but i there were no expectations to prepare me for the whimsy inside the casino doors. 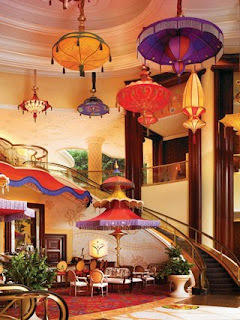 My favorite treats were the room of floating parasols and the amazing lake of dreams. Speaking of entranced, we took a peek at the Lake of Dreams but it was during the day. The glass body of what was still and tranquil, until a giant head sculpture emerged unexpectedly - we thought that was cool - but look what we missed! Gotta love a brand (or fan base) so quick to defend it's own. Check out this new commercial directly attacking iPhone for Verizon Motorola Droid, and the iPhone response. How good does this look? And what a great soundtrack, The Who, The Kinks, The Rolling Stones! My dear friend Susie is getting married in Vegas this weekend, and to celebrate i want to share one of her music videos that i think absolutely belongs in the - wow i have such talented friends categories. The video is for "Bad Shoes" by Dagger Lees, created by Directing/Editing/Writing Duo Susie and Jessie (Susie Morrell, Jessie Ward). Check it out and see below for a little background info from Sue on the concept and the creative process. The Dagger Lees - Bad Shoes from jessie ward on Vimeo. What came first the medium or the concept? Did you have the camera and want to experiment or did the inspiration for the look of the film come directly from the song/artist? The whole thing was inspired by a dress! Donna, the lead singer, found this amazing vintage Victorian nightgown and from that they were inspired to make a video for their upcoming single that evoked a similar menacing, old time air. Well, I guess a nightgown isn't menacing but it's still a little decrepit and creepy! We like the idea of making videos that look vintage themselves and we all decided to make the film look like it was shot entirely on super8 (we both have our super8s and love them, but budget constraints - and practicality - make producing music vids on super8 basically impossible for us). I love the use of the iconic villain from the silent era. Can you tell me a little about the story line and where it came from? Once we had the visual motif in mind, we decided to cast each band member as a unique character. Donna was the little girl lost in a nightmare set in the forest. Grum (guitarist) was the pied piper villain. Benni (bass) was the living doll gone mad, breaking her dolls (possibly a little girl lost herself who never made it out of the woods). And Justin (drums) is the odd man in the background who digs graves and plays with clocks. Thanks! Yes, originally, it was to be all black and white. Then we tried sepia. Then as we were playing with the footage, we watched Donna's singing parts in oversaturated color and thought she looked amazing and that it would be a shame to lose all that color. So a happy accident really! Some parts (like her being tied to the tree) were filmed during a wintry sunset and the sunlight was unbelievable. We decided a happy medium of the cold, old film look in some scenes and the overblown color in others was a little risk we wanted to take. Call it indecision, we think it adds another layer visually. It also adds a little more dreamlike, home movie meets nightmare quality to it. At least we like to think so. A lamb's heart. They were out of pig that day. It was my job to go buy it. The things I do for our projects! Compared to the other videos the two of you have created this one stands out in tone I think. Do you aim to be diverse or is your style more circumstantial? Is this a look you'd like to explore further? How do you and Jesse work together...does one of you tend to be more involved with the talent while the other with the camera for instance or is it a full on collaboration in all aspects? Definitely a total collaboration. Jessie would have been more into the technical side of film school at NYU (she intended initially to become a cinematographer) while I was more interested in writing. Seems we've both ended up in the directing arena, but our two distinct jumping off points in studying film is probably the reason we both like to come up with the ideas, shoot, direct and edit simultaneously. I think we've both mixed nicely as well in that we both collaborate creatively on each project, while both manning the camera (I'm always trying to become more technically adept). It also helps that we're very close friends - I'm sure not many directors are able to share camera and directing duties, then sit in front of an editing suite for days on end without killing each other! We find it fun, if exhausting. 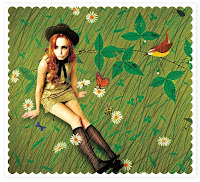 Los Angeles based Dear Creatures has just about the cutest fall look book I've ever seen. I love the girlscout meets golden books aesthetic, and the retro futurism combined with natural elements? amazing! The images are all from photographer Yudi Ela, better bookmark her right away, can't see what else she does! Today I'm proud to be affiliated (read acquaintances) with a brand spanking new nonprofit organization that is not only spreading the love around the world but looking damn good while doing it. Graphic Design friend and Classmate Sean Hewens is responsible for dreaming up and following through with the launch of Smallbean, an organization that takes slightly outdated iPods, digital cameras and other technological ephermera and sends it to communities around the world that dont have such high standards for the bigest, brightest, newest of the new - to be used as teaching aides and to document daily life. The retro rabbit ear TV graphics for Smallbean scream vintage without being boxed in and the illustrated gadget pipeline by Michelle Morin is just darling. 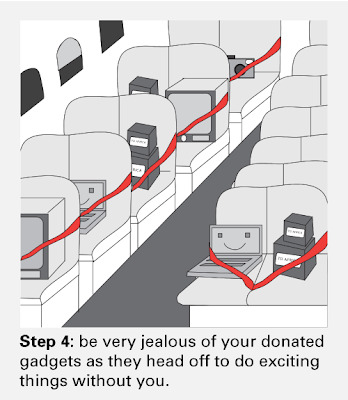 Don't you love the plane full of happy electronics snug in their seats? Go over to Smallbean, play around the site, check out the rest of the graphics, and for crying out loud put your old iPod back to use by donating it to Smallbean! In celebration of today's premiere the of Spike Jonze directed Where the Wild Things Are feature film, Vice has asked 24 of their favorite artists to talk about, and show how the Wild Things has influenced them as artists. They have created a blog full of art, downloads and tons of Where the Wild Things Are goodies. here are a few of the creations that jumped out at me but head over to the site for the full load. Musical Staircase, sidewalk video game, bottomless trash cans - sounds like Disney World doesn't it? It's actually an experiment to change societies habits for the better through fun via The Fun Theory an initiative from VW. I associate it with making a song in order to remember your Social Studies homework or Mary Poppins making a game out of cleaning your bedroom. Check it out. ...while he draws. Very cool. 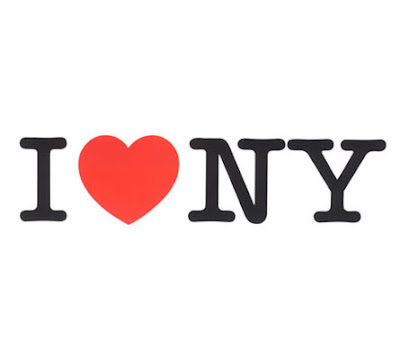 I did my typography project on Push Pin Graphic last semester and have to admit I have a full blown design crush on Milton Glaser (yes I know I'm not alone.) 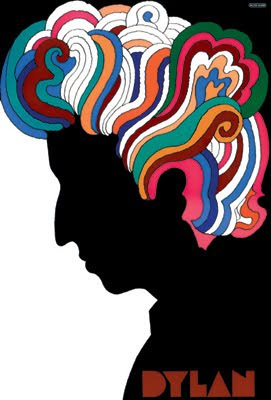 The art, the time, the place, and universal design recognition, Bob Dylan, I heart NY. The fact that he is still around, still sharing his work and his philosophy on art and design is a treat to all aspiring designers. Great video. Love this "subversive take on the casting process" from Legs and Georgie Greville. The aesthetic is somehow perfect for the song, isn't it? I Wanna Be Your Dog from LEGS on Vimeo. Oh nooooo! Gotta love a stupid commercial playing off of a stupid character from pop culture, (i mean stupid in the most love filled make me laugh and want to repeat it all day sort of way.) I mean is it me or is this pothole ripping off Mayor Bee from The Family Guy? Oh Nooooo! An unaffiliated group takes it upon themselves to reclaim over a hundred illegal advertising spaces in New York City. It seems there are a large number of billboard advertisers that cover billboard and building space without permits. PublicAdCampaign covers and re purposes a larger percent of the illegal postings with public art, the result a slightly less ad filled air space, and only 4 arrests. This new take on the giant red umbrella comes from director Frank Budgen. 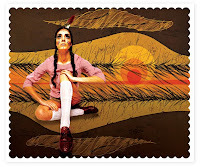 I love the continuation of the whimsy the brand has carried through it's other campaigns. Pretty Gorgeous I think. Check out this video painting from artist Borna Sammak. It's part acid wash, part hidden image painting and totally mesmerizing. I swear I saw some faces in there. Very cool, I want to know more! 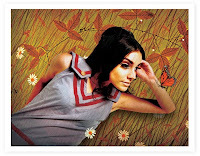 Untitled Video Painting 02 from borna on Vimeo. 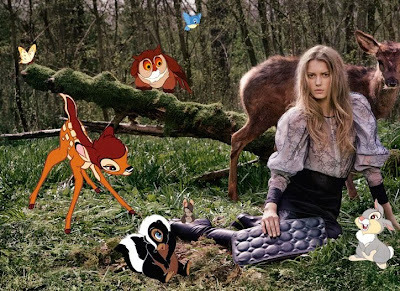 Ryan McGinley snaps these woodland goddesses at rest with the woodland creatures of the Disney Classic Bambi. I love them! My only comment is i wish there were more. The bright animated characters add a fantastic layer of whimsy to what might otherwise be a solemn aesthetic, the fashion fitting is beautifully with the fall forest. Love these vintage fashion videos from the 30s and 60s respectively, about the future of fashion. I'm sure many of you have noticed the barcode that has graced the Google homepage today in honor of the 57th anniversary of it's first patent. The image instantly reminded me on one of my favorite Cannes Titanium Lion winners from years past, Design Barcode Inc.. The Japanese company revolutionized the way the packaging and marketing industries viewed something we always accepted as a given, a packaging blemish that we just had to live with and never questioned. Their simple solutions to "design" barcodes represented a change in thinking and their playful designs supported the idea of fun and aesthetic control combined with necessity. It's beginning to look like a girl power week around here but I couldnt help it. How cute are these films for Girl Guides? These two stop motion animated films are part of the Girl Guides, (Americans think Girl Scouts,) Film Festival. They are not only adorable but support the themes of the organization, encouraging girls to explore, create, and make friends through common interest. Apparently Glamour is following the lead Dove took (how many years ago now?) taking a stand behind real women with real figures and sizes in the double digits on the rack at Macy's. Now to see if they keep to their word, and follow up with realistic models in their spreads and editorials on a regular basis. One can't help but notice the spread on the following pages in this months issue are standard issue size 0-2 models. I guess we'll see - i hope it does become the norm, better late than never! update: the hypothesis behind this piece seems to be that beauty comes in whatever size you are, be that a size 2 or a size 12, now that i like. This is very cool. A stop motion experiment created with a complex layout of illustrations all turned in time. The artist is Donato Sansone aka Milkyeyes. Can't wait to see what he does next. Late last night I saw a new Chiquita Banana commercial! So good, i got excited and I had to share. And of course revisit the original Disney animated spot from the 40's. Enjoy!